Our lease to own payment plans are an average of 12 – 24 months. Pay weekly, biweekly, or monthly in-store, over the phone, and online. We believe in our employees and give them the authority to make decisions in the best interest of our customers and the company. A customer’s concerns can be handled quickly and efficiently. Because we are local we don’t have to jump through hoops to meet our customer’s needs. We offer a better product selection through customer orders and more flexibility with payments and payoff options. We are also the highest google rated lease to own company in Utah! Bring in your active agreement from our competitors to one of our 6 convenient locations and open an account with us. We will give you up to $100 CASH, a better price, and a better product! It’s that easy. Switch to us form. New Product Guarantee*! This means you can return your items, once they are paid off with our lease to own plans, and get a brand new replacement item at no additional cost! 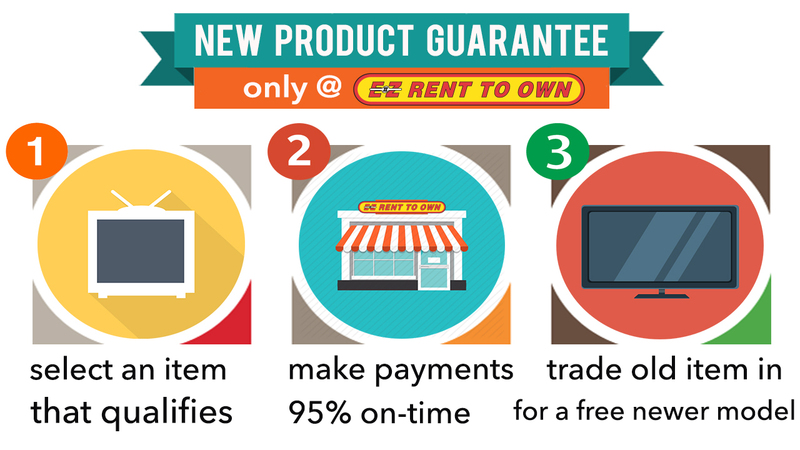 Imagine getting a new TV, sectional or washer and dryer at the end of your payments in exchange for the old items. 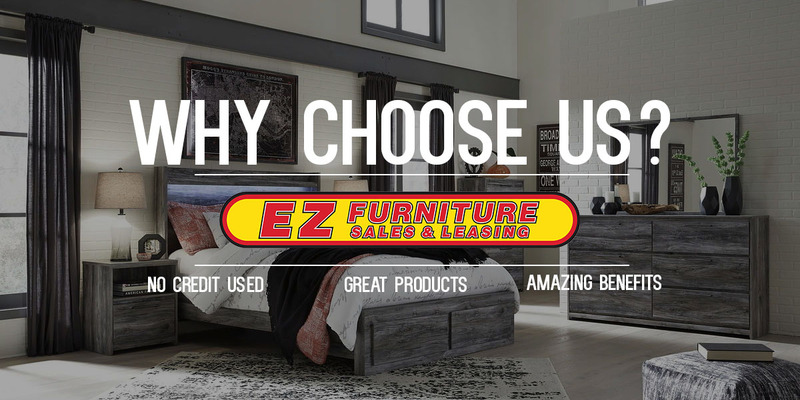 Found only at EZ Furniture Sales & Leasing because we believe our customers deserve the best! *Our lease to own purchase agreements or lease to own payment plans are labeled and signed as “RENTAL PURCHASE AGREEMENT” on file. For information regarding the terms and conditions of our lease to own purchase agreement please see our example lease to own purchase agreement at any store location. New lease to own agreements are subject to our application process which includes a $20 processing fee. Application and updated applications are subject to verification and can be denied or accepted at any time by our staff. Delivery is free within a 20 miles radius or as determined by our staff. If customer self delivers they take all the responsibility for the item during transportation. Set up is free within the determined time frame by our staff. 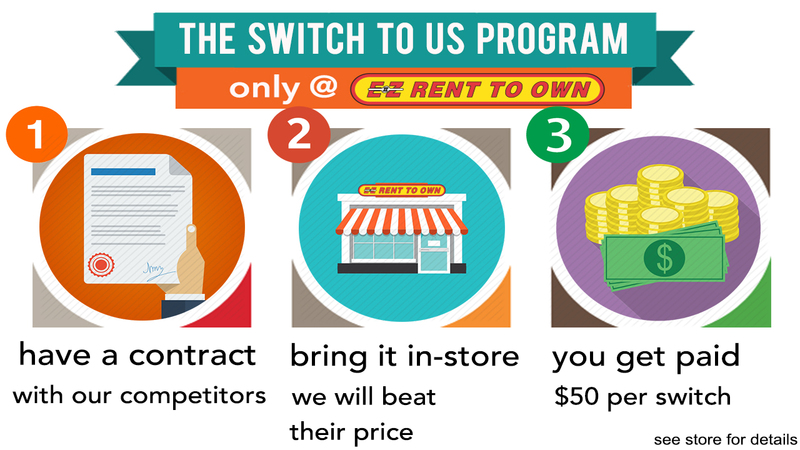 Switch to us cash is only paid (up to $50 per agreement) when new a new lease to own agreement is opened at any of our locations and the corresponding competitor agreement is closed. Cash for junkers is for new lease to own agreements only. Trade in amount is applied as a credit towards the total balance of the lease to own purchase agreement.